We really need to up our hat game. 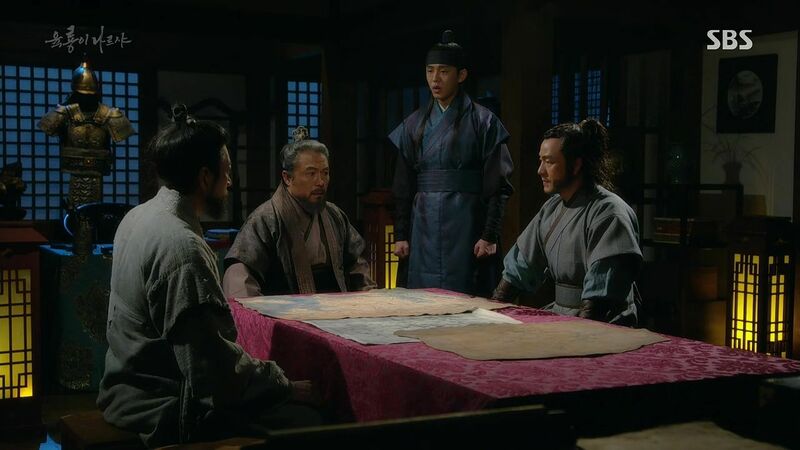 Let me spread to you the good word of Six Flying Dragons, my new obsession-slash-fandom. It’s a historical Korean drama—by which I mean it’s produced in South Korea and subtitled in English. It’s a semi-fictional account of the real political turmoil that ended in a dynastic change in the 1390s, when the nation of Goryeo became Joseon. WOW, does that makes it sound super boring, right? You know how exciting Hamilton is? How it takes the dry facts and dusty mythology of the American history you sorta knew and injects it with the vibrancy and urgency of what it was like to live through those times? Six Flying Dragons does that, too. It’s all of the personal drama and spine-shivers of “Wow, this really happened,” except that, for me, it opened up realms of compelling history that I’d never heard a whisper about before. And it’s magnificent. Curse you, American educational system! Here’s one of my very favorite parts (out of the like 4390410 favorite parts I have) from Episode 16. The powerful Haedong Gapjok family is having a secret meeting to decide what to do about an ultimatum from the prime minister. They can throw their lot in with their in-laws, the family of Yi Bang Won (who are the protagonists, by the way). Or they can declare their in-laws traitors, throwing them to the wolves in order to avoid angering the current powers that be. So what happens? Yi Bang Won shows up in person at their midnight meeting with a big wooden box. He says it’s full of gunpowder, and he’s going to blow them all sky-high if they don’t see things his way and support the Yi family. Even he doesn’t know if he’s telling the truth—it might very well be gunpowder. And then he lights the fuse. OMG. So badass. Trust me, you really, really want to watch Six Flying Dragons. It’s a commitment—the whole run is fifty one-hour episodes—but I personally guarantee that you won’t regret a single minute of it. You can find it streaming online in a number of places with subtitles and, listen, you really should. This show is amazing. And once you do watch it, come find me online. I’m dying to have other fans to talk about it with!